Abstract: The performance of container terminals needs to be improved to adapt the growth of containers while maintaining sustainability. 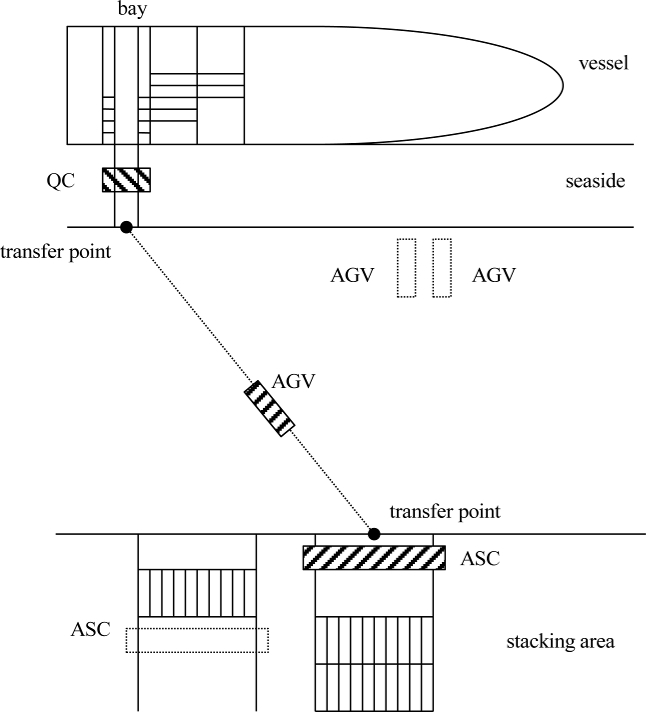 This article provides a methodology for determining the trajectory of three key interacting machines for carrying out the so-called bay handling task, involving transporting containers between a vessel and the stacking area in an automated container terminal. The behaviors of the interacting machines are modeled as a collection of interconnected hybrid systems. Hybrid model predictive control (MPC) is proposed to achieve optimal performance, balancing the handling capacity and energy consumption. The underlying control problem is hereby formulated as a mixed integer linear programming problem. Simulation studies illustrate that a higher penalty on energy consumption indeed leads to improved sustainability using less energy. Moreover, simulations illustrate how the proposed energy-efficient hybrid MPC controller performs under different types of uncertainties. Reference: J. Xin, R.R. Negenborn, G. Lodewijks. Energy-efficient container handling using hybrid model predictive control. International Journal of Control, vol. 88, no. 11, pp. 2327-2346, June 2015.